Good luck today! I really like these images too! You know what, use GPS blocker to jam all secret devices in your room or at work. I love those old-fashioned bathtubs, and that faucet image is pretty charming, too. They add so much character to a bathroom! these are so pretty. hope you and the little man are doing okay!!!! These photos drew me in. Thank you for sharing. Oh love those fish prints--so cute! Good luck today--thinking of you and hoping all is well! 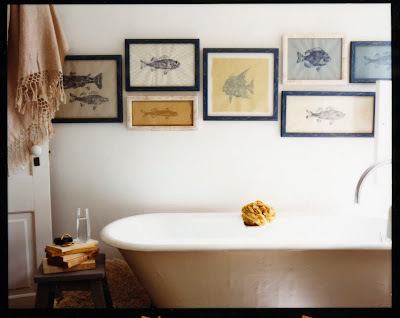 And the fish prints inspired me that more is more for my bath- instead of just hanging one pic. thanks!! oh my gosh!!! i LOOOOVE those two photos. The fish prints are now my new obsession...gotta find those asap! and that brass faucet is aged to perfection. Ohhh that faucet is the mostly lovely thing I've laid eyes on in a long while. Not to mention the flowers beside it...and the sponge in the tub. Love it all. Thanks for sharing! hope you and little man are doing fine. Hope your shot is painless as possible and i love those fish prints, you find the best images! 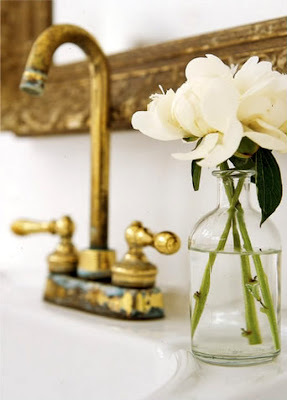 Love the flowers in the vase and the contrast against the faucet. So pretty. I love a "just because" day. Thanks for posting! That makes me want to go get some fresh flowers! Good luck to you!! Hang in there! Such lovely images! Love the bathtub with the fish collage!